Conventional therapies—such as chemotherapy—do not precisely target their disease, and this lack of precision can often lead to harmful effects in patients. Acute hepatic porphyrias (AHPs) describe three rare genetic diseases that damage the nervous system, affecting mostly women (at a ratio of 5:1). The diseases cause debilitating abdominal and limb pain, along with cognitive symptoms many patients call “brain fog.” These intermittent attacks often lead to hospitalization and are currently treated by injecting large doses of heme (part of hemoglobin) intravenously. While the treatment alleviates symptoms, it taxes veins and can cause iron overload in the patient. In the February 7 issue of The New England Journal of Medicine, a team of researchers published the results of a phase 1 clinical trial for the drug Givosiran, which targets the liver cells ultimately responsible for AHP. During the trial, Givosiran dramatically reduced porphyria attacks experienced by patients, with few adverse effects. John Phillips, PhD, and Charles Parker, MD, both of whom work at the University of Utah Health, collaborated on this study with a team of researchers. In patients with AHP, a genetic mutation creates an inefficiency in the long molecular production line that ultimately creates heme. This inefficiency produces a buildup of a neurotoxic molecule called aminolevulinic acid (ALA). The excess ALA produced in the liver spreads throughout the body, causing the painful symptoms associated with the disease. AHP is traditionally treated by injecting heme into the body because it participates in a biological feedback mechanism. As more heme is introduced, the body makes less, which also reduces the amount of ALA produced. Givosiran presents an alternative way to treat this disease. It is an example of a new class of drugs—RNAi therapies—that reduce the expression of specific proteins in the body. In this case, Givosiran, given as a subcutaneous injection, reduces the production of an enzyme called ALAS1, which is responsible for the buildup of ALA. The researchers found that monthly injections of Givosiran steadily reduced ALA to nearly normal levels. 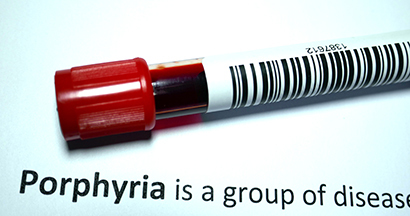 Consequently, patients experienced a dramatic reduction (as much as 79 percent) in their average number of annual porphyria attacks. The most common adverse effects were common cold symptoms, diarrhea, and abdominal pain. Serious side effects, reported in six patients, included severe abdominal pain, bacterial infection, auditory hallucination, and opioid-induced bowel problems. One patient died following hemorrhage of the pancreas, but this event was determined to be unrelated to Givosiran. The phase 1 clinical trial was placebo controlled and involved a total of 40 patients. Since the publication of these results, Alnylam Pharmaceuticals has completed clinical trial phases 2 and 3 of Givosiran and announced positive outcomes. Phillips and Parker participated in these studies as well. Alnylam is moving forward by applying to the FDA for market authorization. Parker and Phillips were joined by an international, multidisciplinary group of scientists in this study, titled Phase 1 Trial of an RNA Interference Therapy for Acute Intermittent Porphyria. The research was funded by Alnylam Pharmaceuticals.